Many people have problems with their teeth. Some individuals feel that their teeth look crowded; others are worried about crooked teeth in their mouth. Visiting your orthodontist to discuss your unique situation is imperative, but you can take a look at some common treatments to get a sense of what common problems are. This problem results when the lower front teeth come up in front of the upper front teeth, which causes a sort of reverse smile. Not only is this problem aesthetically unappealing for those who experience it, but they can also go through a significant amount of pain as a result. Braces can correct both of these struggles. This issue is one that results when the lower front teeth bite into the palate, and the issue can grow progressively worse with age. Teenagers and young adults who ignore this problem may find that they need surgery to fix it in the future. Sometimes, the teeth begin to crowd in one particular area. For example, you may have three or four teeth that are so close together they seem to overlap. Some of the teeth may get pushed back as a result, and the smile is not straight. In this case, certain teeth are missing from the mouth. The braces can help to bring the other teeth into the right positions. After that, the lateral incisors are implanted into the mouth to produce a full smile. Some people have spaces in-between their teeth that are too large, and braces can help to close up those spaces. On top of that, some patients will wear glued-in retainers to ensure that the spaces do not open up again. When you have front teeth that protrude out, that is called an overjet. Sometimes, the process to repair this issue includes two phases. One phase may help the jaw to grow properly, and the other can assist in aligning the teeth. People can have all different types of issues with their teeth. As a result, different solutions exist. Some individuals do not need braces to recover, and the orthodontist provides these services as well. In some cases, parents are concerned about the way their children’s permanent teeth are growing in, and with this type of process, the situation can be rectified before the teeth have a chance to grow in the wrong way. We use this appliance when we want to gain extra space to resolve crowding. Your baby molars on the bottom are usually much wider than the permanent teeth that take their place. On most people, all that extra space is closes your 6 year molars come forward. If we use a holding arch, we can use the extra space to take care of crowding in the front. The facemask is used to treat people that have an underbite because of a skeletal deficiency in the upper jaw. It attaches to an appliance in your mouth with elastics. We recommend that you wear your facemask for at least 14 hours a day, unless you’re in trouble at home. Then mom and dad have permission to make you wear it to school. This is the least invasive appliance that we use for people with open bites. Typically, these open bites are caused by finger habits or tongue thrusting. This roller provides you with a gentle reminder to remove your finger or position your tongue more favorably. If it doesn’t work, we can always move into something razor sharp. 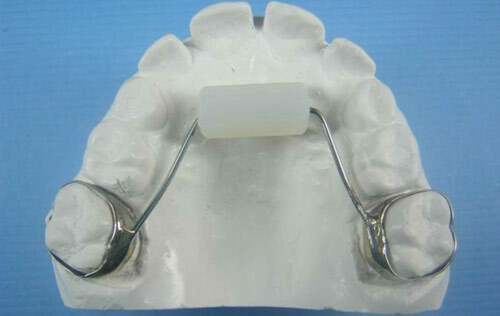 We use an expander when the upper jaw is too narrow. The appliance is turned by you (typically once a day) and works by slowly separating the two halves of your palate. Don’t worry if you develop a space between your two front teeth because that means it’s working. Feel free to take full advantage of your temporary ability to shoot water between that space. This appliance is occasionally used after the braces come off. If you had an openbite to start with and your teeth are prone to relapsing, we will use the positioner as a retainer. Or if you are a boxer. Our diode laser can be used to perform a number of procedures. Most commonly, we will use it to help uncover a tooth that is stuck in the gums. It can also be used to aesthetically contour the gums after treatment. We use these springs when you have a severe overbite. They are locked onto you braces and wires, so you cannot take them in and out. They are the equivalent of having hydraulics on your car. Very stylish! As you can see, the available treatments and appliances span across the board. That is why scheduling an appointment with Beecroft Orthodontics is so important. It helps you to see what the right treatment plan is for your personal condition.